Our huge seven bedroomed, five bathroomed home, Bernisson is a self catering home from home, suitable for all ages and fully equipped for babies and tot, and for grown ups too! Our gorgeous, renovated old farmhouse full of modern luxuries, is the perfect holiday rental a peaceful location, but just 2km from the beautiful Bastide of Monsegur & 10km from Duras. Just inside the borders of the Gironde on the borders Dordogne & Lot et Garonne, just 15 min to A62 Auto route, 40min to Bergerac Airport & 1hr to Bordeaux Airport. Your holiday home has a fabulous large heated swimming pool with amazing views over the Valley of the Dropt. With numerous alfresco patio areas where you can sit for a long & lazy, romantic lunch a deux or with all your guests for a bottle of local wine and a BBQ . Enjoy the games room with pool table, table tennis & baby foot or the cinema room! Or perhaps a game of boules on the boules court. 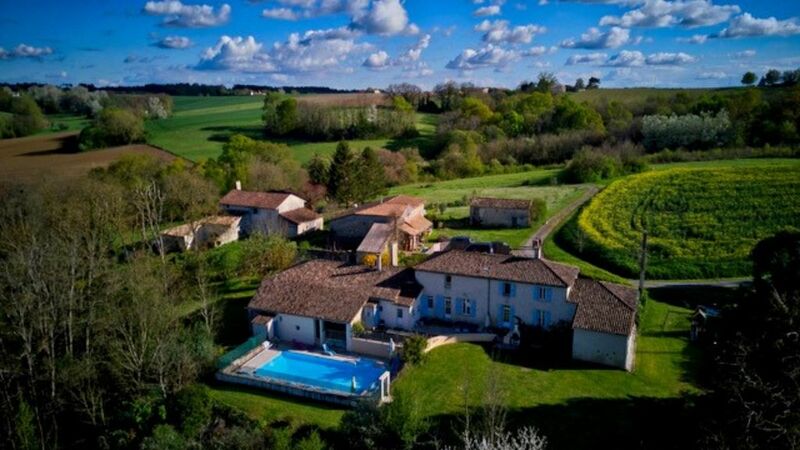 Your holiday rental is surrounded by the vineyards of Entre deux Mers & near to the famous Bordeaux and Bergerac vineyards & a number of lakes with man-made beaches. Large dining kitchen with wood burner, big stove, dishwasher, fridge, food processor, microwave, cooking pans, dishes and utensils. Table and chairs for 14. 1 twin with shower room along the hall. Double with ensuite bathroom..bath, separate shower, bidet and toilet. Wine tasting and vineyard tours: There are literally hundreds of vineyards in this wonderful area, offering wine from a few centimes to thousands of Euro a bottle, and it is interesting to learn the different methods used from vineyard to vineyard from the traditional to state of the art. We can hold wine tasting days at the house or arrange a driver for you to take you out and enable you to explore and have the opportunity to taste the different varieties. Creative courses: We run short breaks incorporating floristry, upholstery and cookery courses if you decide to tear yourself away from the pool or to return during the winter months with a group of friends. Golf: There are many golf courses around the area. The fantastic Château des Vigiers Golf and Country Club, with restaurant and Beauty Spa, is a 30 minute drive away. This famous 18 hole course was created by Donald Steel. The Château dates back to 1597 and is set in 450 acres of beautiful countryside. Our coup de Coeur! We drove around the bend at the top of the drive and saw the house nestled on the hill with its amazing far reaching views across the Dropt valley, we knew that no other house could be more perfect for us! Or for our many guests who return year after year to holiday en famille! Amazing views from the terrace and a beautiful, peaceful location that is peaceful and secluded but is close to historic bastide towns with restaurants, shops and bars. You can park your car up for the week and explore locally on foot or by bicycle. The house is configured in such a way that there is plenty of space for extended families or groups of friends, with enough eating and sitting area to spend time together but also spacious enough to find have your own space. Large farmhouse kitchen with huge table seating 14-16, ancient stone fireplace with woodturner, French windows to the front garden and door to the rear terrace. Secluded rear terrace with views over the Valley of the Dropt, and the heated and fenced 12X6m swimming pools. 2 large tables each seat 12-14 and the terrace leads to the covered games room. We (six adults, six children aged between 4 and 18 months) stayed at Bernisson for a week at the beginning of June this year. Firstly, the website does not do the house justice. It’s absolutely gorgeous, wonderfully furnished and the grounds are just lovely. The house is amazingly well-equipped and had everything we needed including huge amounts of plastic plates, cups, cutlery for the children, quality wine glasses for us (always so nice when you’re on holiday and you’re not just supplied with a few cheap wine glasses), cooking utensils, plates, children’s games, DVDs, baby monitors, etc etc. Jenny and Doug are lovely hosts – extremely welcoming, available when needed and totally unobtrusive when not. We had a wonderful meal cooked by Lucie and served by her husband Malcolm and a wine-tasting evening arrange by Paul at La Tour de Chollet (both recommended by Jenny). We were so well catered for at the house that we barely left – the children loved running around the grounds, playing table football in the games room, swimming in the heated pool and generally enjoying their freedom and we loved the relaxed atmosphere, the well-stocked and beautiful accommodation and the beautiful views from the terrace with a glass of wine once all the children were in bed. We’ll definitely be back. My girlfriend and I had a wonderful time at Bernisson. We went 'en famille' to celebrate a birthday, so there were eight of us including a toddler. The house had everything we needed and the views of the surrounding countryside are beautiful. We really enjoyed eating and relaxing in the garden with a glass of wine during our stay. The table-tennis and pool table provided the family with plenty of amusement during our stay. It was still a little too cold for a swim as it was early March, but the pool looked very inviting and we look forward to trying it out on the next visit! Monsegur is within walking distance where you can enjoy a quiet beer or coffee and the local supermarket had everything we needed. We would definitely recommend finding the time to have a hot chocolate at the Chocolaterie des Lys where Philippe and Veronique will extend you a very warm welcome. Jenny and Doug are lovely, we couldn't have wished for more and I am sure we will be back again soon. Having spent a fabulous week at Bernisson, it has to be unique. A fabulous farmhouse within 1 mile of all facilities yet secluded and private. Within 30 minutes of arriving all 13 members of our family were in the private pool, all ages from 81 to 10. The property is not overlooked at all, and from the terraces and pool the veiws across the verdant countryside are breathtaking and peaceful. The main kitchen in Bernisson is well equipped to cater for groups, and we often cooked the main course in the main kitchen and desserts in the 2nd kitchen. There is stuff in the main kitchen that we do not even have at home! The owners were on hand in a neighbouring property if needed, and Doug checked on the pool everyday and maintained it thorughout our stay. He also let us know which towns to visit for the daily market and other events in the locality. The owners did not at all interupt our stay, but it was really reassuring that they can be called upon at anytime. All in all, Bernisson is fantastic, unique and relaxed. It is big enough so that 13 people had complete privacy, yet has cosy terraces and lounge areas where you can gather in groups or for dinner. As soon as we arrived at Bernisson we were blown away at how beautiful it was. The setting is fantastic, and you get amazing views especially at the back of the house. We were a group of 6 adults and 7 children and the house was more than big enough for us all. There are lots of lovely touches with the decor, and furnishings, and each bedroom seemed like a special space to stay. We really didn't move much from the property - the kids just wanted to play in the pool, the games room and the grounds! We did have a good lunch at nearby restaurant - think its called Les Charmailles just out of Monsegur - they have an outdoor terrace, and bog grounds so great for kids to run around after they have eaten - it was a three course lunch for around 11 euros - amazing value! We loved the house. Our family arrived en masse - 6 adults and a stack of children from 15 down to 2. There was something for everyone to do - fantastic amenities - the older ones spent all their time in the games room and pool, the little ones splashing in the shallow end and playing with the many toys both indoor and outdoor. Spacious enough so that we each had our own areas - but fabulous communal places to eat inside and out. As well as a lovely TV room for relaxing. Can't rate it highly enough ! We loved the town too and particularly nearby Duras which is very beautiful. Also there is a lovely beauty salon just five minutes from the house which does the most amazing chocolate facial !!! The owners were really welcoming and couldn't do enough to help. Every need is catered for and the kitchen is stocked with absolutely every little detail you could ever need. We're really pleased you enjoyed your stay at Bernisson, it's not often we have an all adult group and it's good to hear that there was plenty of room for you all to have lots of individual space and to enjoy yourselves so much. Also, thanks to your bird spotting skills, it was wonderful to find out we have a green woodpecker in the garden and to hear about the red stars and all the other nesting birds. Thank you for coming to stay. Monsegur village centre is around 2km from the house and a half hour leisurely stroll or 2 min drive will have you in the heart of the town. You'll find a beautiful covered square, with Halle designed by Gustav Eiffel. The shops and restaurants nestling under ancient archways include a wine bar, pizzeria, beef restaurant, bars, bakeries including a lovely Mexican/French baker La ChocoLatine with an amazing selection of breads, cakes and delicious chocolates all with a mouthwatering Latin twist. Explore the ancient walls and learn about the history of this pretty Bastide town with intriguing links in history. There is a colourful Marches Nocturne every Wednesday night during summer where local growers and producers sell an amazing range of freshly cooked local food and spend time tasting the fabulous array of this diverse regions wines. Duras with its famous château is approx. 10km drive or an hours cycle ride. There are lots of beautiful Bastide towns, all with colourful markets, 1 to fill every day of the week, and all within an hours drive. 45 min drive will get you into the gorgeous old town of Bergerac and a hour to the elegant City of Bordeaux. 1 min drive to the nearest small supermarket on the outskirts of Monsegur.A 20 minute drive takes you to Fontet, near La Reole, a marina and lake with a man made sandy beach and supervised bathing, large children's play area and cycle trails along the canal and to the River Garonne. A 30 minute drive will take you to Blasimon a fresh water lake with a nice sandy beach, fishing and lots of picnic areas. A 90 minute drive will take you to the famous family friendly beaches of Arcachon and Bicarosse with the chic Lacanau about 2 hours drive. A 25% deposit required upon booking and the balance is due 8 weeks before the start of your holiday. We also ask for a £350 security deposit which is refundable after a satisfactory inspection of the house and contents. It is possible to split the house into a 3 and a 4 bedroomed property in the lower season and we also do B&B.